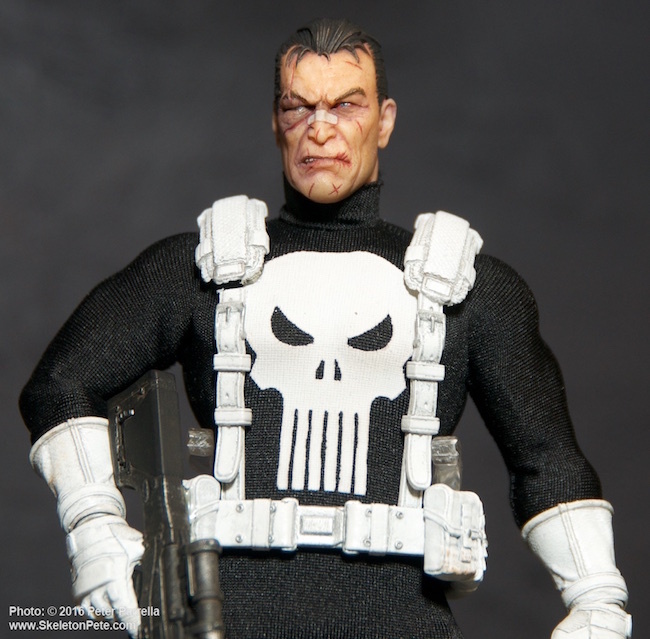 Punch Drunk Love: Marvel Comics’ Punisher gets Mezco’s detailed One:12 Collective treatment. 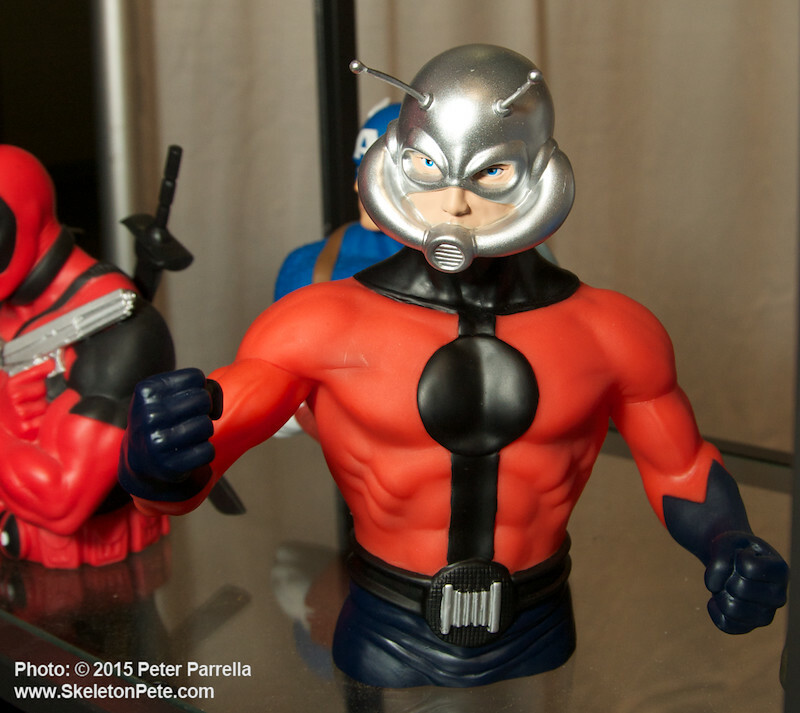 I’ll keep the chatter down since this post was promised as a gallery of prototypes for Mezco Toyz‘ burgeoning One:12 Collective series first revealed at their pre 2016 American International Toy Fair event. 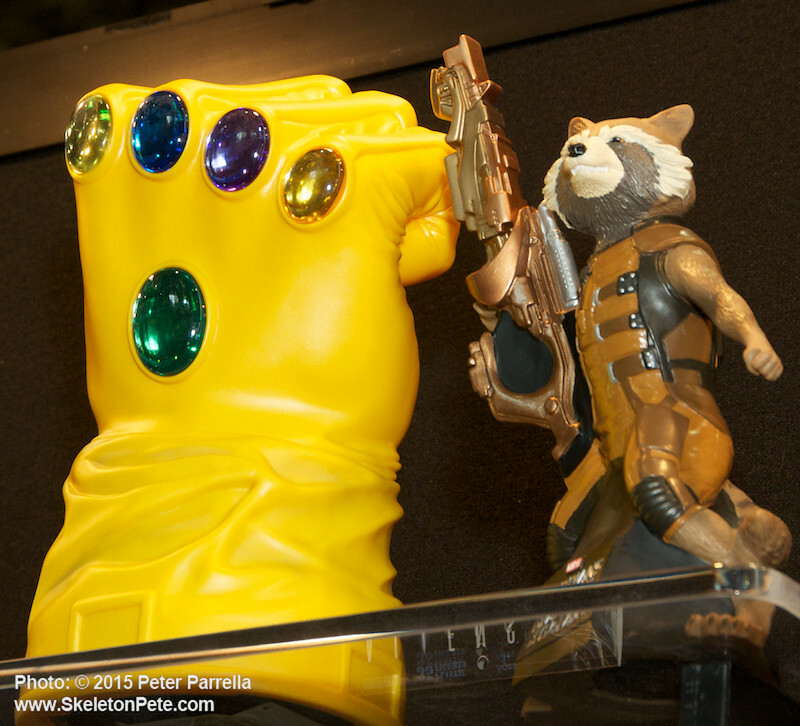 Take a look, the details speak for themselves. 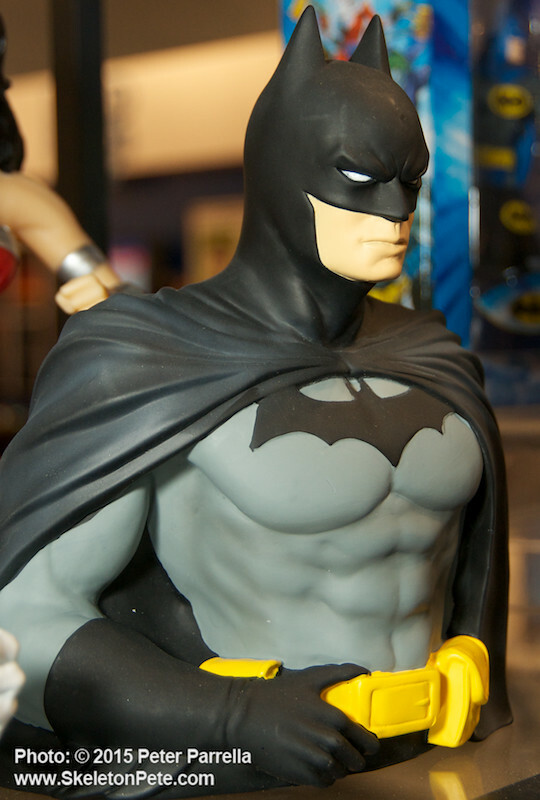 Having had hands on experience with the Dark Knight Batman and the Star Trek Mr. Spock I can say that the production models are as refined as the prototypes. 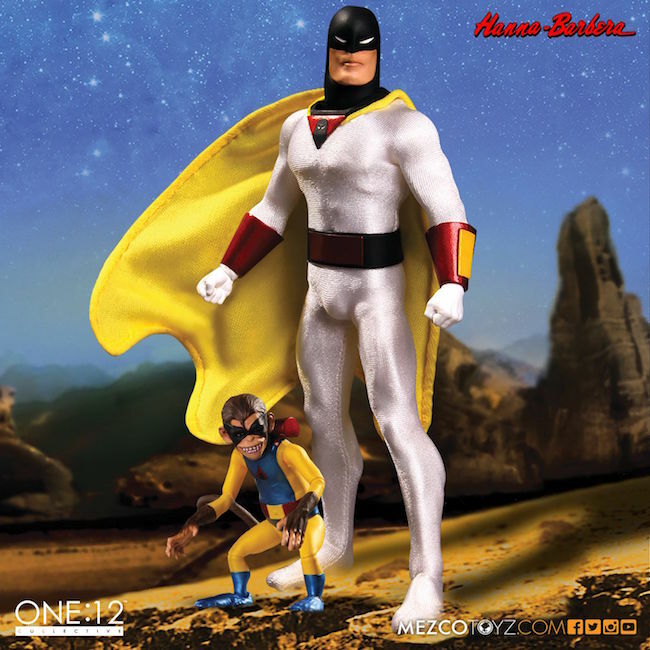 I recommend you make a point of checking out Mezco’s website for information on each character, it’s accessories, and the pre-order schedule. 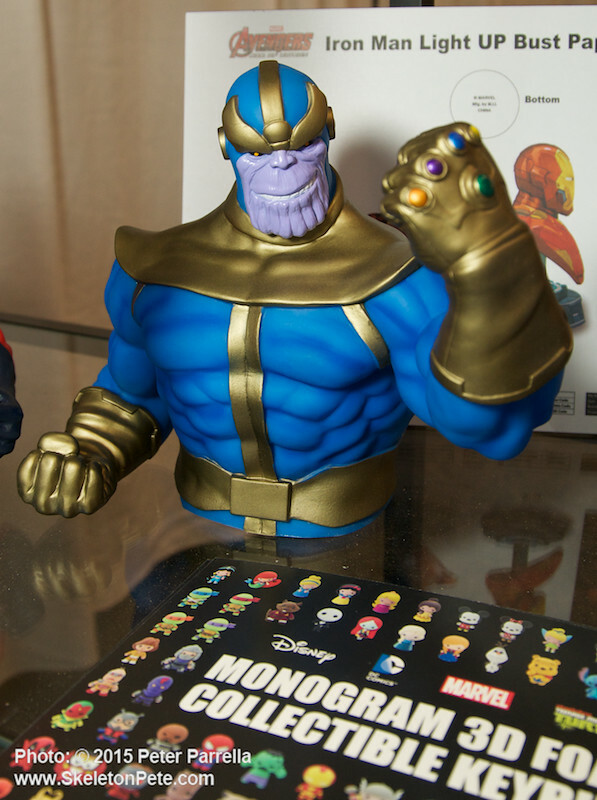 Many are selling out early. 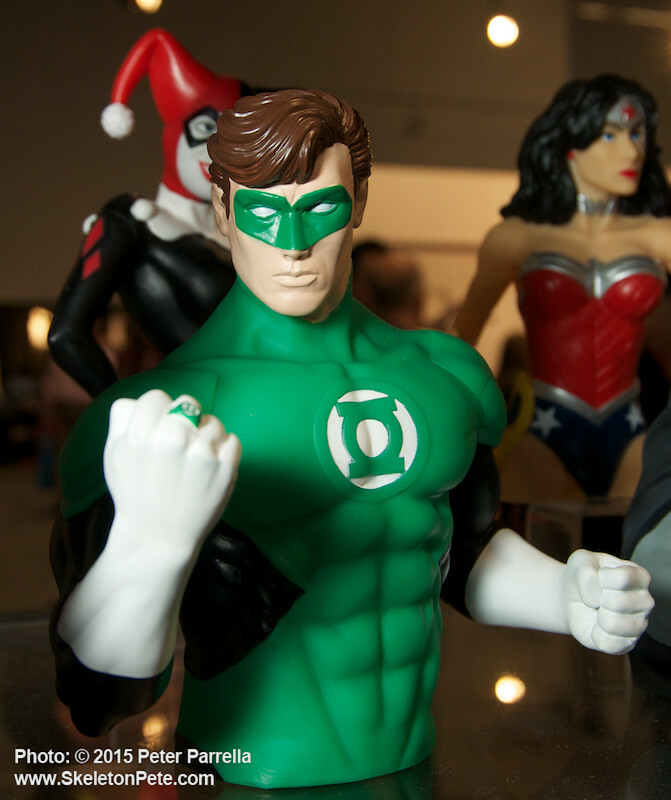 Monogram International Inc. is noted for their years of creating unique licensed collectibles and novelties, and I’ve been tracking their creations over many Toy Fairs. 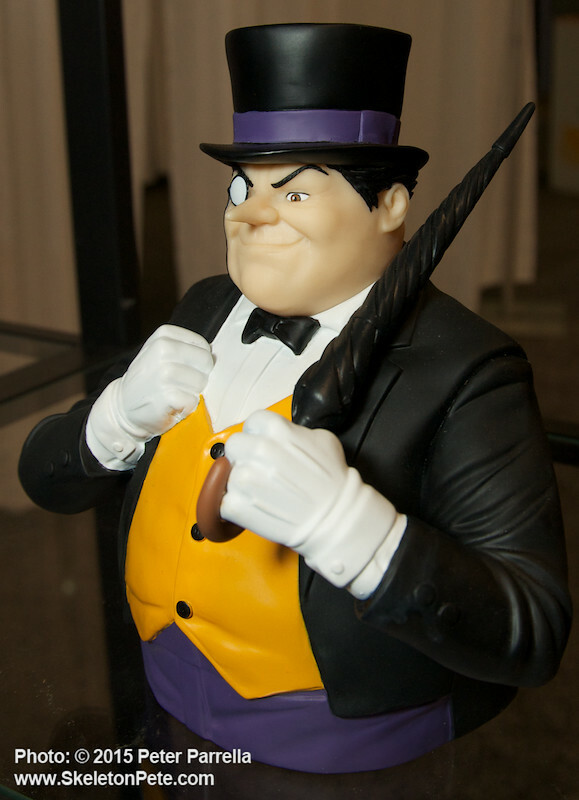 Their bust banks are particular favorites of mine, and they have created many ComicCon exclusives in this range. 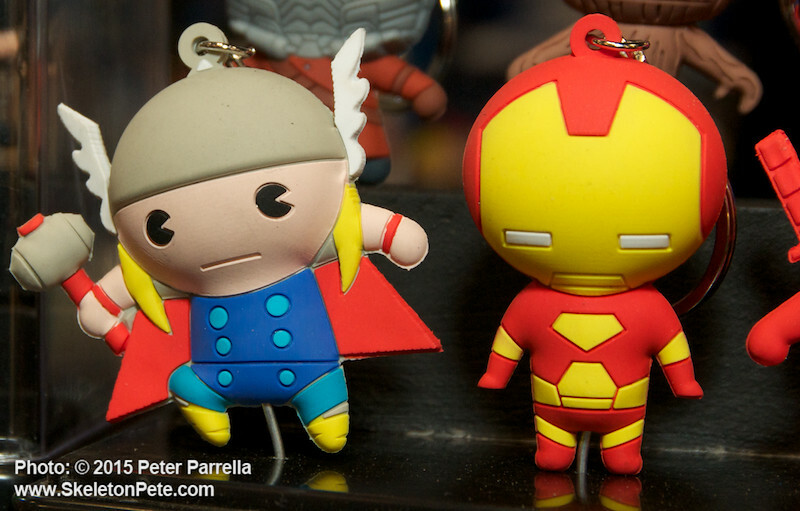 Antman and Loki are stand out additions to the line this year. 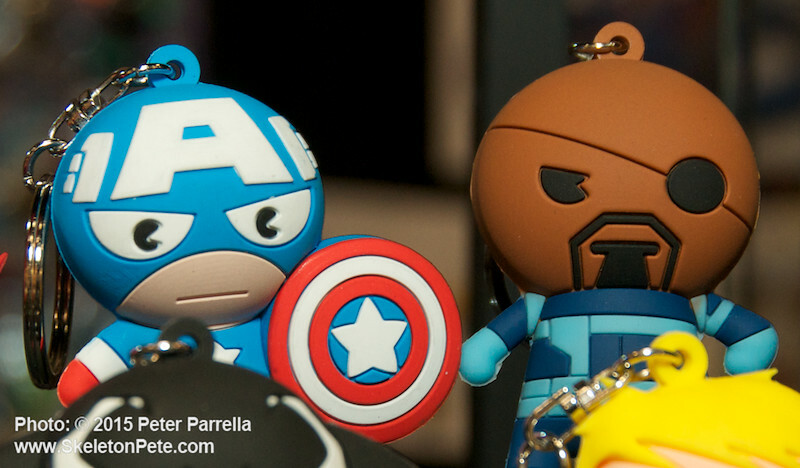 Photographing the varied items at their 2015 New York International Toy Fair booth, I quickly became enamored with Monogram’s soon to be released series of 3D Foam Figural Key Rings. 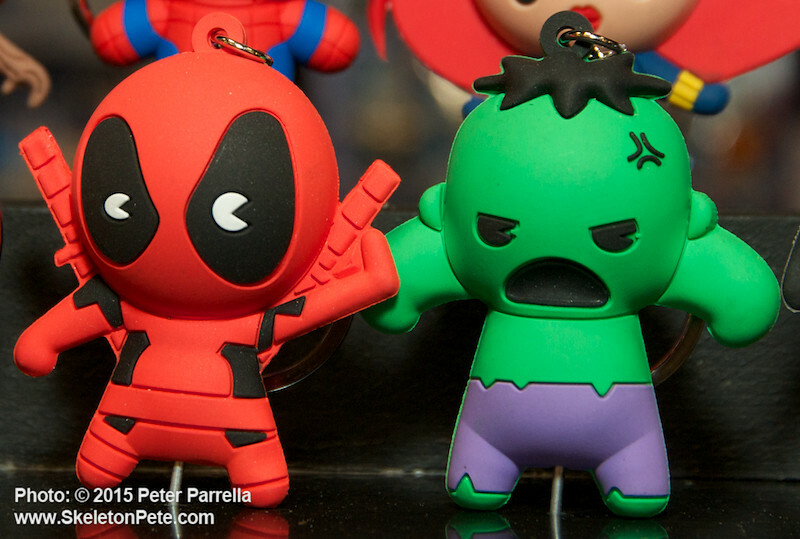 Licensing spans the Marvel, Disney, Teenage Mutant Ninja Turtles, and DC universes. 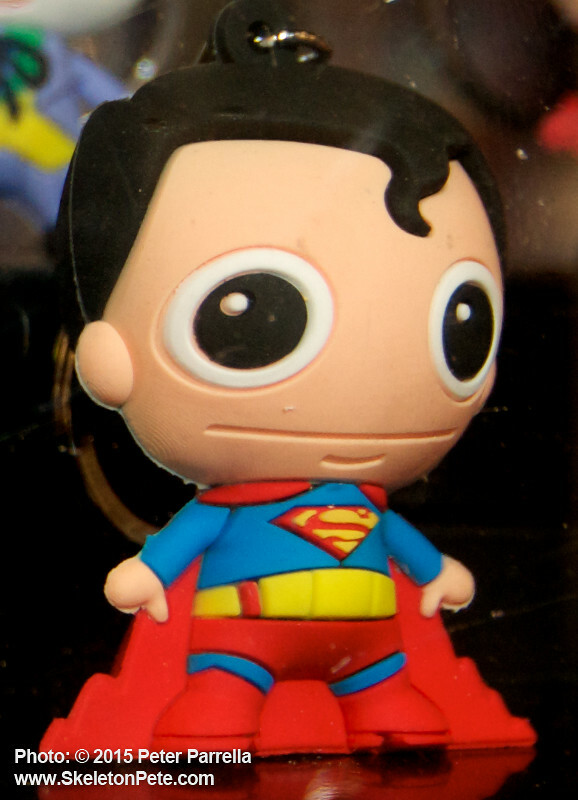 The 2” characters have a nice chunky feel, soft but not “squishy.” Their super cute wide-eyed designs are fun and inventive and should make them popular with both youngsters and collectors of stylized characters. 3D Figural Foam Keyring Foil Packs and Display Box. 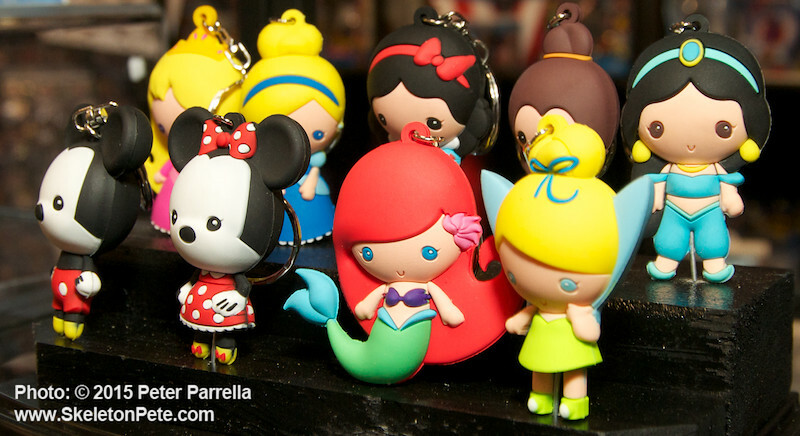 Each keyring series includes 9 standard characters and 2 exclusive figures. 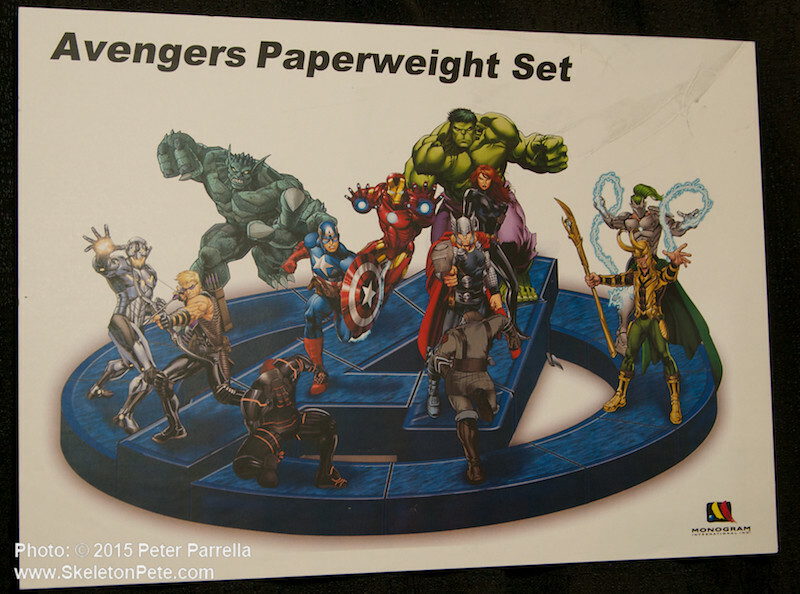 Marvel Series 1 includes, Spider-Man, Hulk, Nick Fury, Hawkeye, Black Widow, Iron Man, Rocket Raccoon, Groot, Star-Lord. 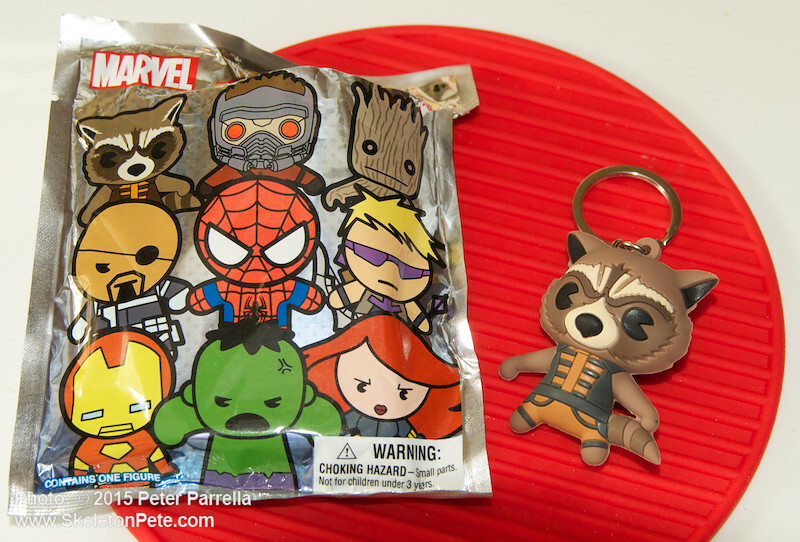 The two “chase” characters illustrated on the bag in silhouette appear to be variants of Iron Man and Rocket. 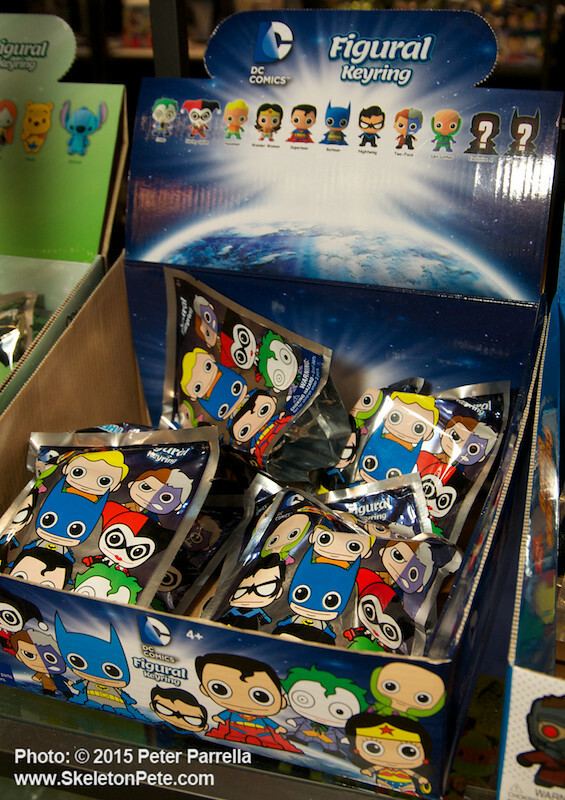 They will be sold as foil pack “blind bags.” Inside each package the characters are wrapped in cardboard to discourage the “touchy feely” collectors from trying to divine their purchase in advance. 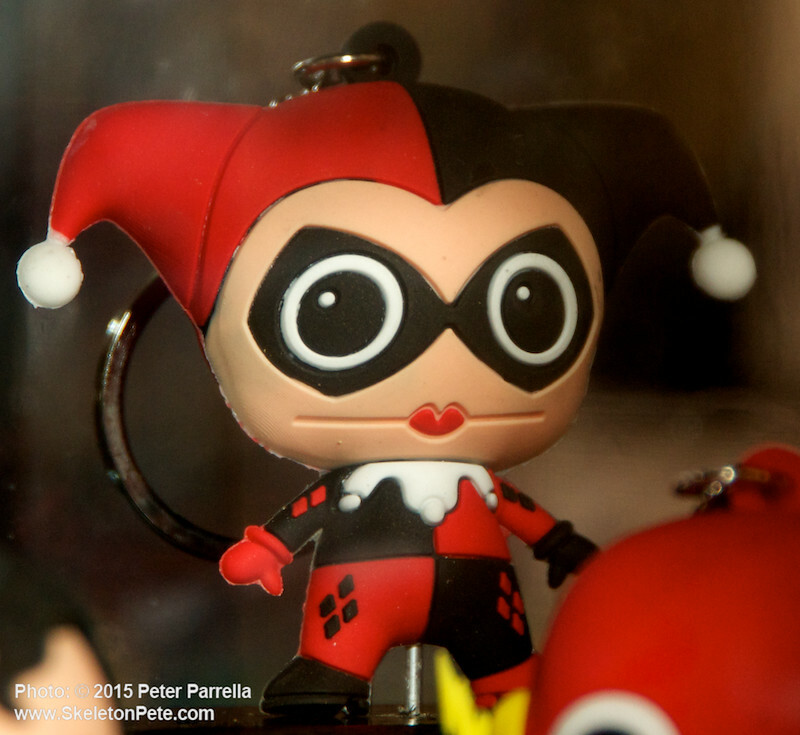 It keeps things honest and trading brisk. 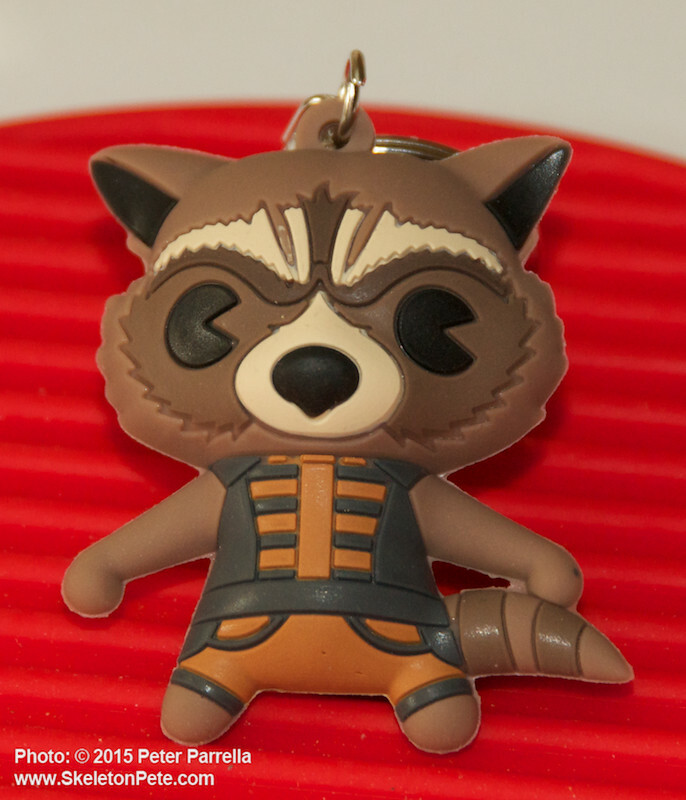 My Monogram Rocket Raccoon 3D Keyring just hanging out. The Monogram folks were so kind as to offer Ken Pierce (PiercingMetal.Com) and I a mystery bag each, and of course we opened them immediately. 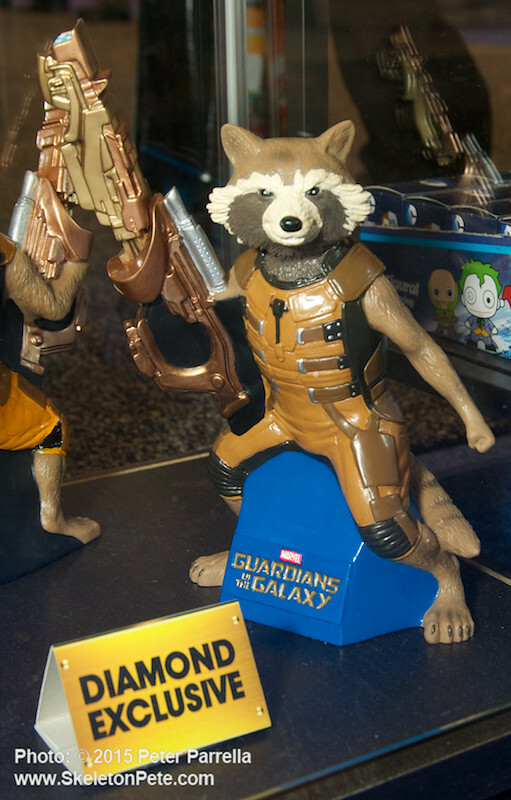 I was happy to find Galaxy Guardian Rocket Raccoon in mine, especially since he was not included in the Monogram display. 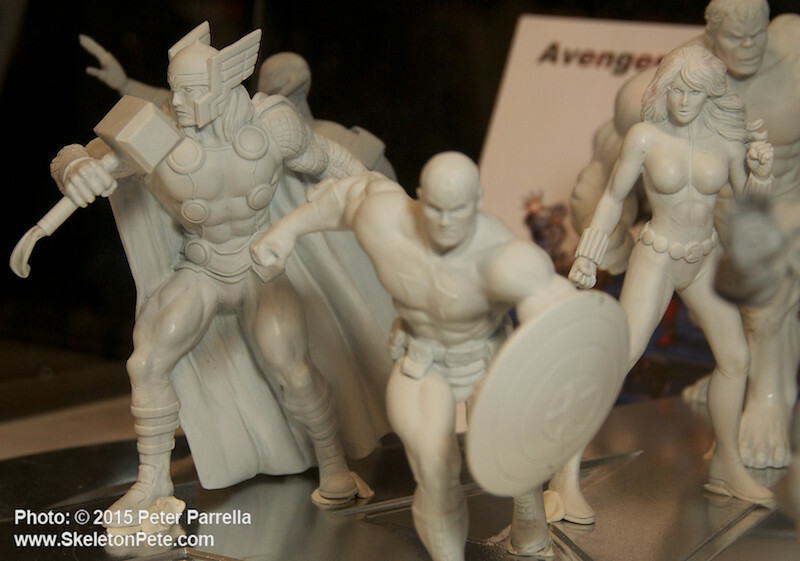 Monogram’s Avengers Paperweight as a work in progress..
Monogram also unveiled a very early look at their Marvel Avengers paperweight. 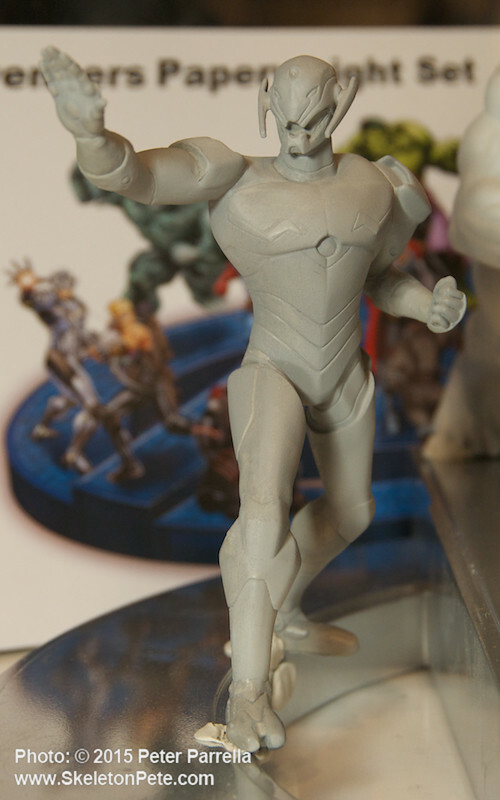 Shown in unpainted prototype it’s an out of the ordinary collector’s piece, nice for the desk of that comic obsessed executive you know. 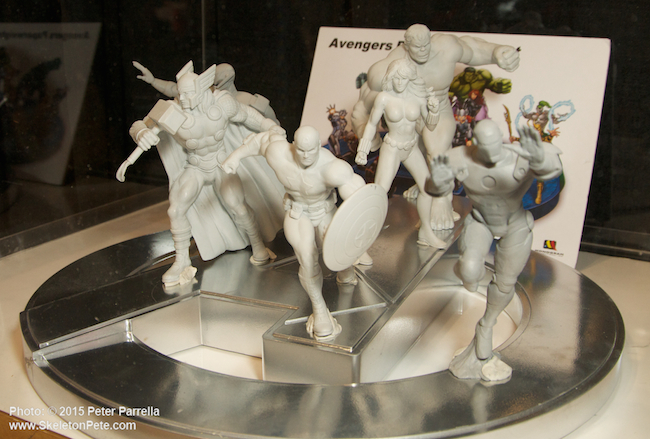 Standing atop the Avengers logo, Thor, Iron Man, Black Widow, Captain America, Ultron and the Hulk are all nicely sculpted ranging at what seemed to be 4-5 inches tall. 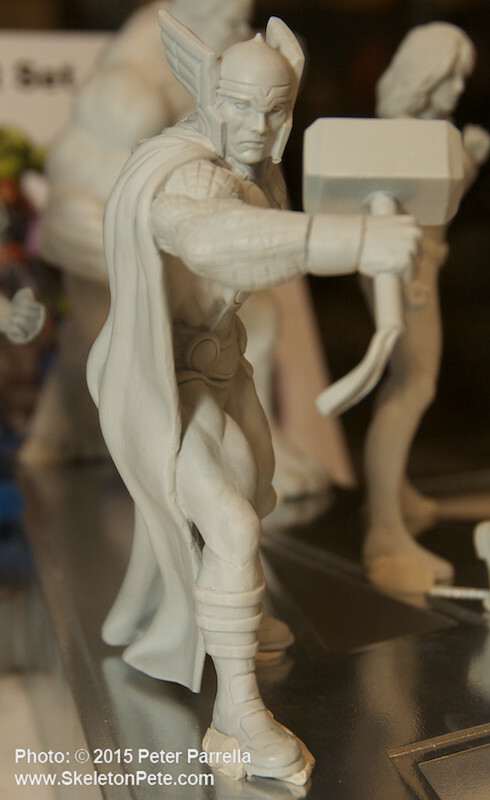 Although not shown at Toy Fair, likely still in the sculpt stage, the company’s product art illustrates The Abomination and Loki as part of the set as well. 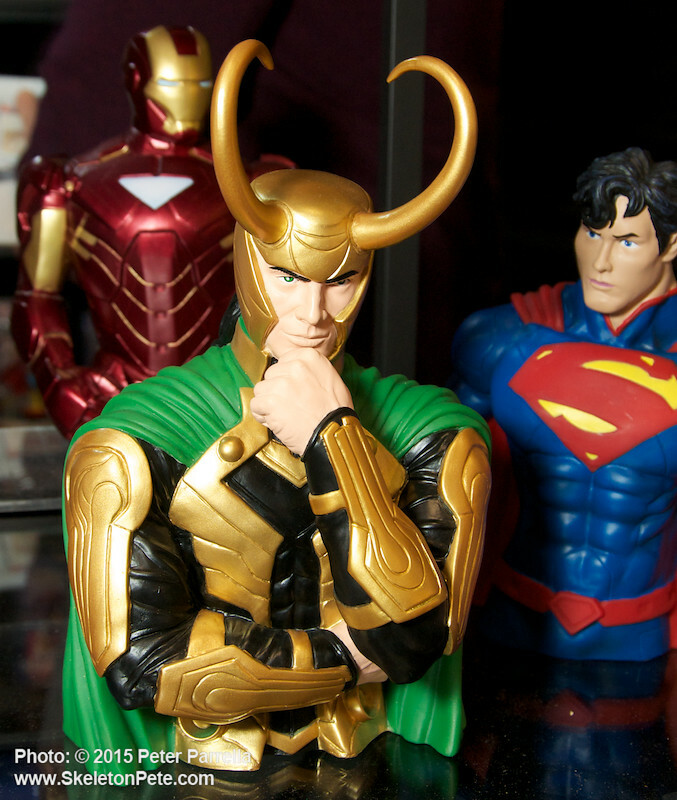 Loki ponders what universe he’s in, as Superman looks on. 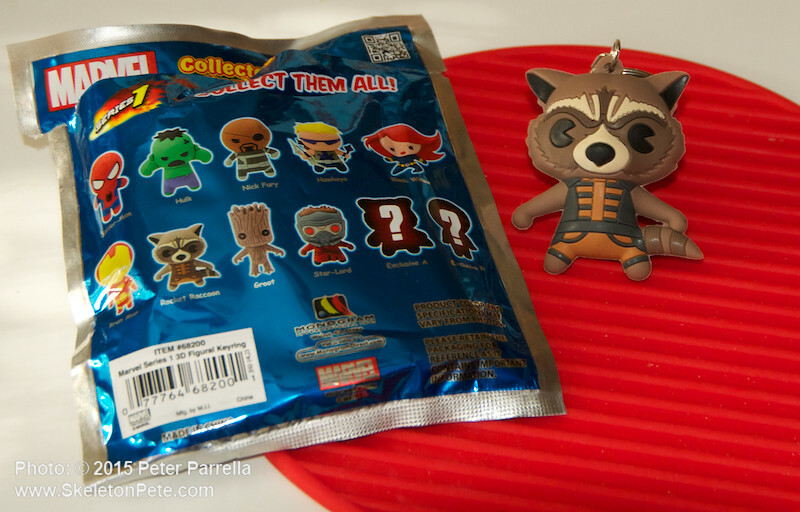 Though not originally a fan of the mystery box or blind bag collectible model, I’ve come to understand its strengths. 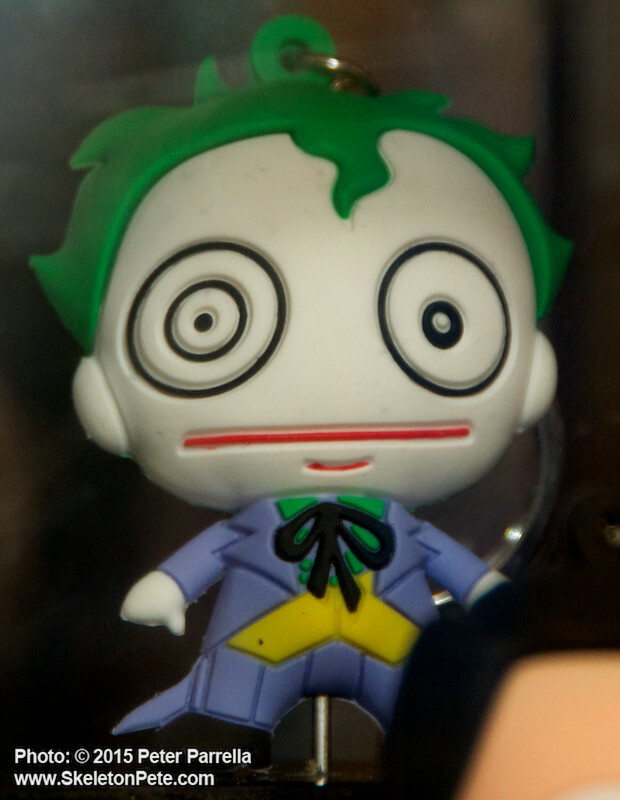 Commercially the “thrill of the chase” for your favorite characters certainly drives sales but psychologically adds a layer of fun via anticipation and surprise. 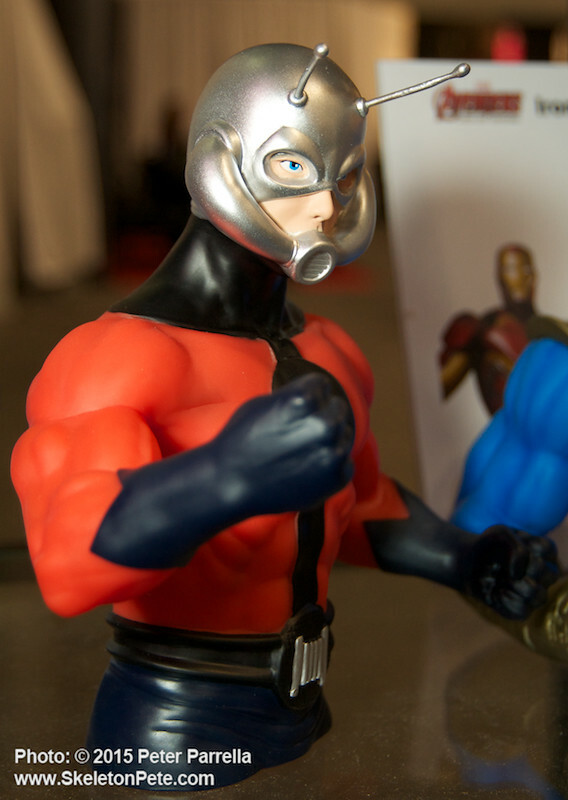 That’s not such a bad thing for kids to experience in a world of mostly instant gratification. A personal analogy is how much I enjoyed chasing after 45 RPM’s with Non-LP B-Sides by my favorite musical artists. Now those “bonus” tracks are a click away for download and not truly special at all. Saint Valentine’s Day seems the perfect opportunity to share this photo with you. 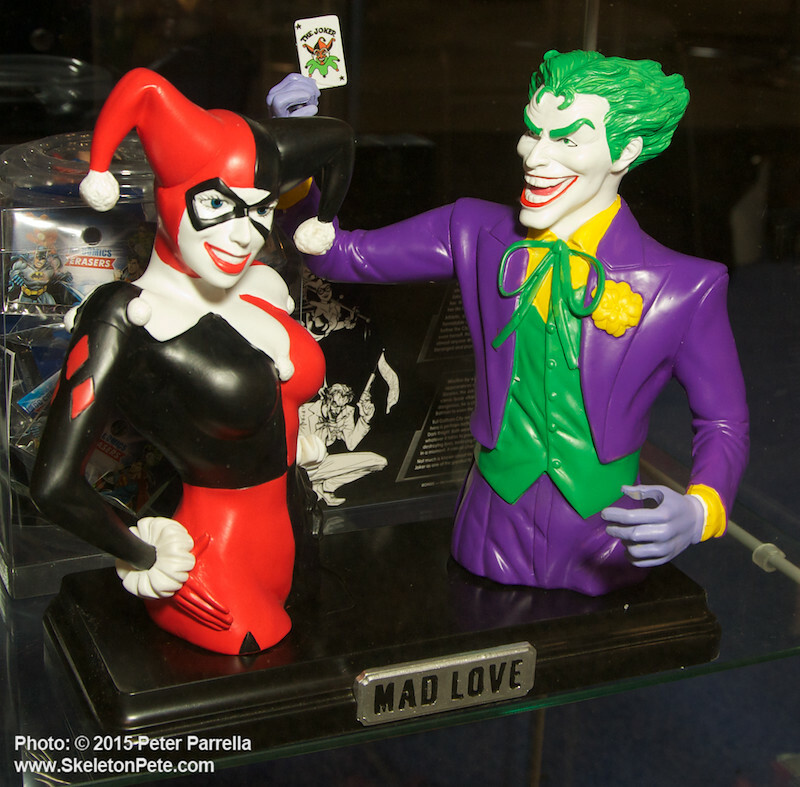 It’s a little romantic surprise snapped at this week’s American International Toy Fair in New York City. 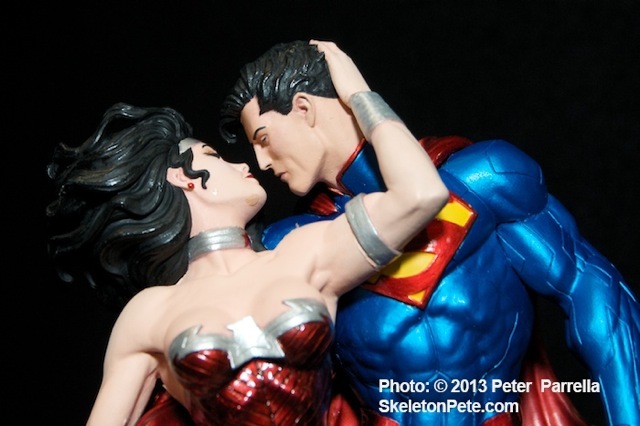 Yes, even the “Man of Steel” and the most empowered woman on the planet need love. 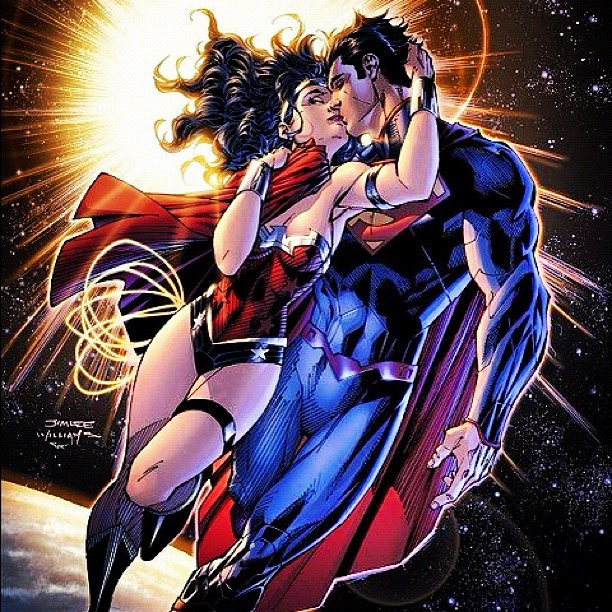 Superman and Wonder Woman’s hook-up in the New 52 era of DC Comics has been cause for much fan discussion over the last year. 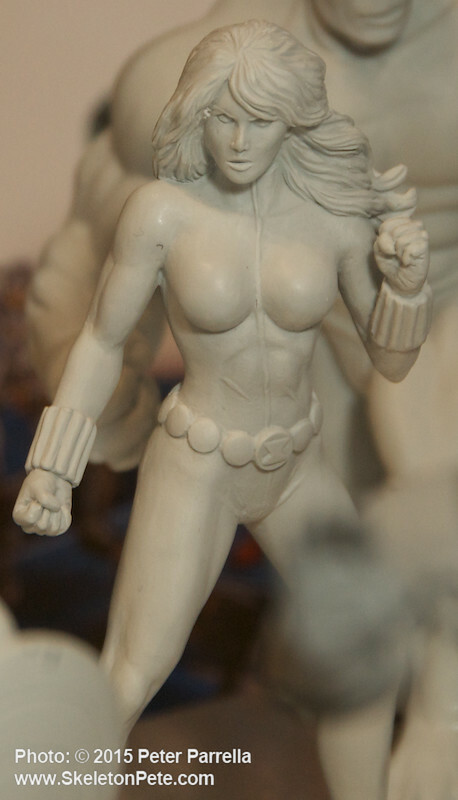 The photo above is a unique shot of DC Entertainment’s prototype for their upcoming resin statue depicting Kal and Diana in a lost-in-the-stars embrace. 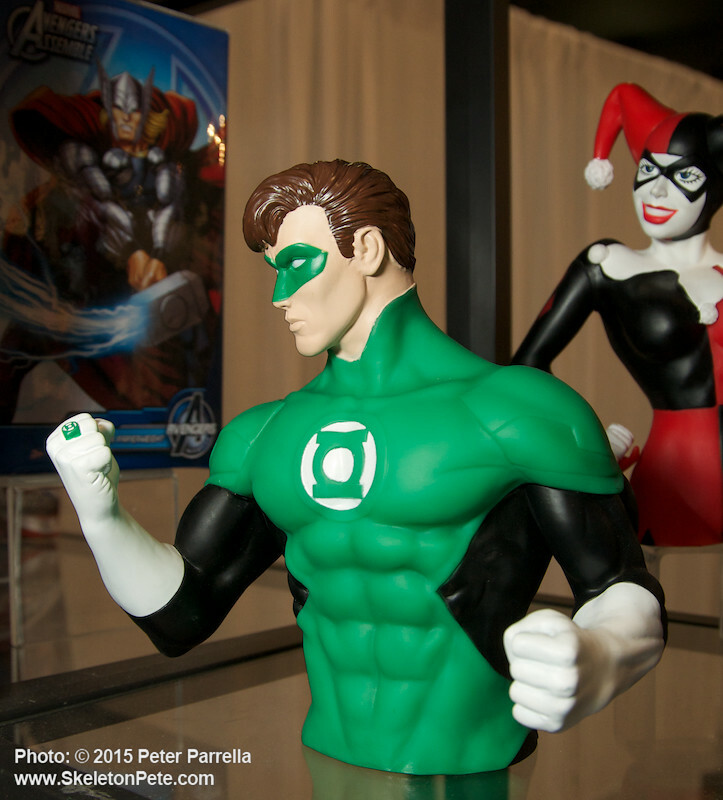 Unfortunately, the at the moment one of a kind piece was damaged in transit and was not officially on display at DC Entertainment’s booth. 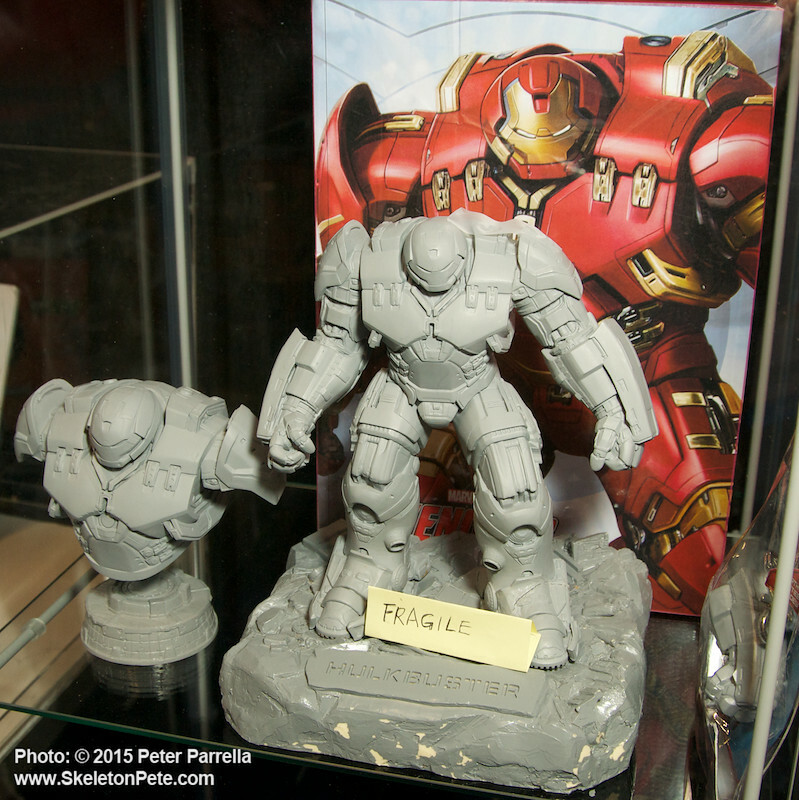 Thanks to the kind folks behind the scenes Ken Pierce and I got a sneak peak at part of this beautiful sculpt, though not its entire tableau. 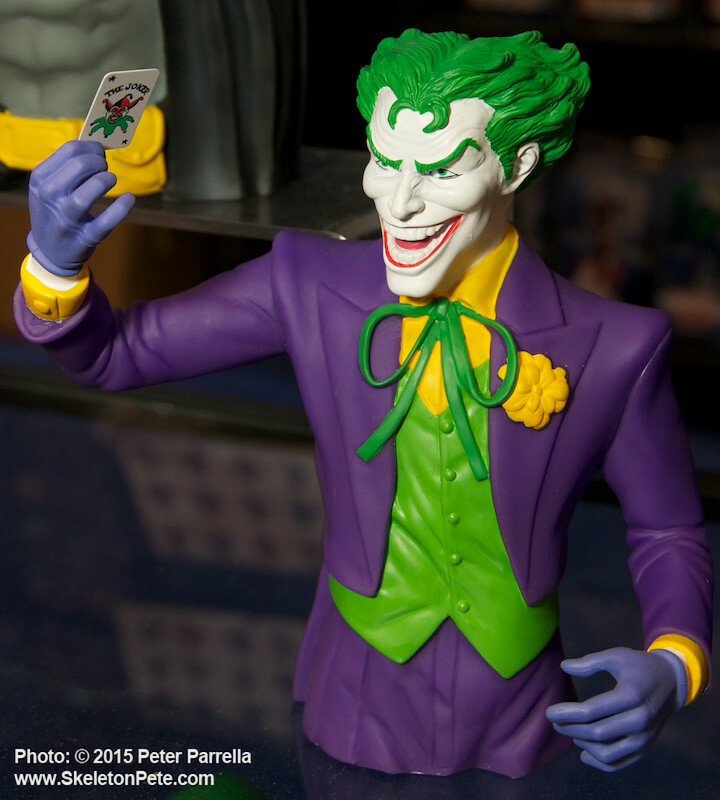 They’ll be more to come as the release date and ordering information is announced. 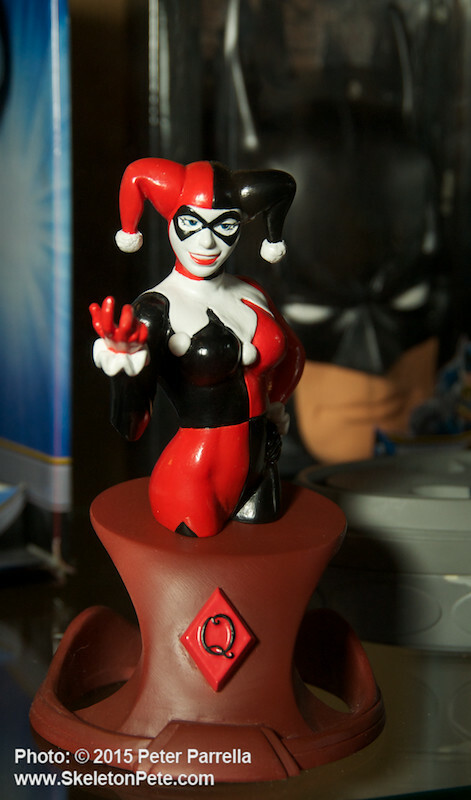 Keep an eye out here and at PiercingMetal.Com for lots more coverage and photographs of DC’s awesome array of collectibles to be released this year.